Do have an engaging profile. For brands, this means creating (or converting) your profile to a business account and verifying your website. It also means adding a recognizable profile photo, connecting your social profiles, and using keywords strategically in your description. Do begin with a content plan. Look for ways to entertain, inspire, or educate your followers on topics they find interesting. If you need ideas, check your web analytics to see what’s most popular, or ask for suggestions in your next newsletter. Aim for a balance between original and curated content. 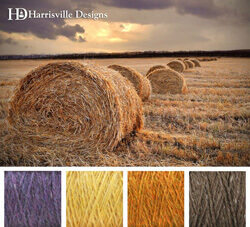 These inspirational yarn color palettes are posted weekly to the Harrsville Design’s Pinterest page. But plan a few surprises now and again – especially when it rewards your followers. Boost engagement by trying some content in the form of a series (at left). But stay true to your brand – keep your content focused to your mission. Do use hashtags and keywords. They go in your board titles and descriptions, as well as your image description on each pin. Be sure to describe what’s in the image, but also think about why a person is searching and how your pin might be the answer. Do use rich pins. Rich pins are a new, and still developing, feature on Pinterest. They provide more context for certain types of pins such as recipes, movies, and products. To have rich pins appear beneath your images you’ll need to embed meta tags into your website. You can learn more about the process here. Do use high quality images. Using professional looking pictures makes yours stand out in a space that is very visually competitive. Because they also tend to inspire more of a connection, high quality images are more often repinned, too. Choose images in which your subject fills the frame, especially vertical shots that command a larger spot in Pinterest’s feed. Where did your eyes first go when you saw this screenshot? Do make your web content pinnable. Include eye-catching, high quality images strategically on each page to give users a pinnable bookmark. Don’t forget to make use of “pin it” buttons near images, charts, and infographics, too. Do encourage users to click through. A pretty picture might easily get you repins, but where is the incentive to click through and visit your website? Indicating there is more content waiting on the other side, and that it’s worthwhile, is both important and challenging. Use thoughtful labels, price tags, and calls to action in the description to give viewers a reason to make the leap. 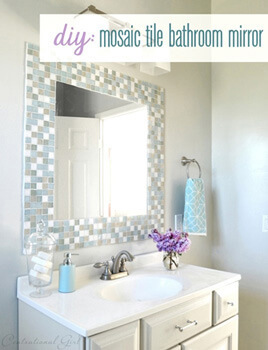 This photo went from bathroom décor inspiration to DIY weekend project with a label that lets you know a tutorial is waiting on the website. Do link back to the original source. No, not Tumblr or Google Images, the original source. This means carefully including links with any image you pin, and also checking all images before repining to one of your own boards. It’s about giving credit where it’s due. It’s also about sharing reputable, useful websites with your followers. Use Google Images to find the original source of an image. Fix broken links and give credit where it’s due! Is there anything more tragically annoying than finding an image on Pinterest promising a cool new product or useful tutorial, only to click and find the link – like all your hopes and dreams – broken? Or worse, linking to an infinite loop of reblogs on Tumblr or redirected towards a spammy website? Well now you can find the original source of the image through a reverse Google Images search! Simply save a copy of the photo in question to your desktop. 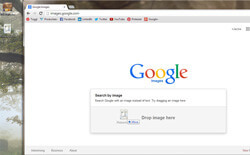 Then go to images.google.com and drag and drop the image from your desktop to the search box. Voila! Now you have a list of websites where the image is likely to be found. Use this trick to make all your pins on Pinterest link properly. Do keep your boards shipshape. Nobody wants to dig through a disorganized mess, so think carefully and create succinct profiles for each board. Review pins and boards occasionally for relevance and utility. Don’t be afraid to delete content that has gotten stale. Do make secret boards your secret tool. Secret boards are great for organization. They can be used to plan out a board scheme, even allowing you to pin images to a live board in a more meaningful order. They can also be used to store images for quick access later when you are short on time. Do be social. It is a social network, after all, which means you should participate in conversations. Follow relevant users, comment, like, and repin their content. You can also thank users (or return the favor) for sharing your content, too. Do track your progress with analytics. What’s the point of having a content plan if you’re not checking in to see how well it’s landing? You can use Pinterest Web Analytics or a third party application to monitor which pins are the most popular, get the most repins, and redirect more visitors to your website. Track your progress to see which content is most successful. There you have it. Pinterest etiquette is about being a team player – creating and curating useful content and presenting it in a way that followers find intuitive. Businesses with good pinning manners tend to be more successful on Pinterest, so take these tips seriously! Don’t be an encyclopedia. Don’t create a board for every popular Pinterest category in an attempt to gain more followers. In the long run you’ll have more engaged users when you focus on a specific niche. Find your voice and know your target audience. Don’t oversell yourself. Nobody wants to be bombarded with advertisements and promotional material. Instead, focus on pinning inspiring, entertaining, or informative resources from your website. Be sure to curate content that your followers would find useful from other sources, too.